YakAngler member Dave (dfwagnerjr) from Kentucky came down to Florida recently on a short vacation. He told me he wanted to see what the Gulf had to offer, so we made plans for a morning trip to Estero Bay. I picked him up at the hotel and we drove along the beach to our launch. We unloaded our gear in foggy conditions at Little Hickory Pass, and I familiarized Dave with the Hobies. It was a little windy but otherwise a nice morning. We started the day with topwater lures and hit the flats. We worked mangroves and open flats and had no luck for the first hour or so. We ducked into some backwater creeks, looking for redfish. Dave hooked up with a drag screamer and fought the fish in. It was the first of two nice jacks on topwater. I managed a small snook, and we moved on. We travelled farther into Estero bay to some good redfish areas. 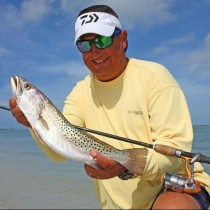 Dave began using a DOA shrimp under the mangroves during the very slowly rising tide. He worked the edges for a while, and even saw some redfish that just weren’t feeding. We were doing everything right, but the fish didn’t care. On the way in, we tried one more area in a mangrove tunnel. Lots of mullet were hanging around, but none of the fish we were looking for. We caught a few fish, but the reds eluded us. It was great meeting and fishing with a new friend - even if he is from Kentucky!